Sister Kimberly A. Miller, who crashed her car into an auto repair shop, is on leave at Little Flower High School. 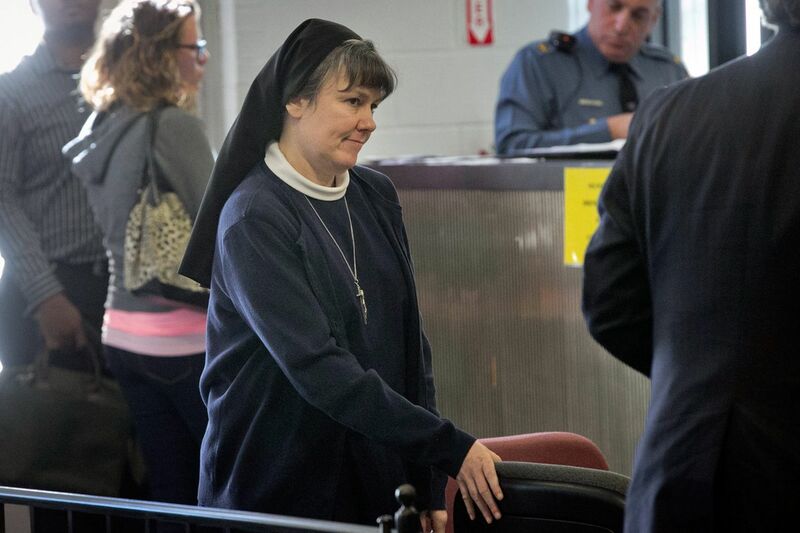 A Philadelphia nun convicted of driving while intoxicated will not get her teaching job back this school year, archdiocese officials say. A substitute will continue to teach Sister Kimberly A. Miller's theology class at Little Flower High School for Girls in Philadelphia, spokesman Ken Gavin said. "A decision was made to stay with the substitute in these few remaining weeks for the sake of continuity," Gavin said in a statement. The school year ends June 17. Her teaching status for the 2016-17 school year will be decided later by the Office of Catholic Education. Her order, the Sisters, Servants of the Immaculate Heart of Mary, which supported her in court during her trial, is also reviewing the case. "I don't know what the archdiocese will decide, but Sister Kim was born to teach," her lawyer, Jeff Lindy, said in an email Thursday. "That's what she loves to do, and that's what she's great at." Miller, also a librarian at the school, was placed on administrative leave last fall after she was charged with driving under the influence after crashing her car into an auto repair shop on Route 42 in Turnersville last Nov. 7. Police said her blood-alcohol level was 0.16 percent, twice the legal definition of drunken driving in New Jersey. Police said a half-empty corked bottle of wine was in the backseat of her car. During a trial in Washington Township Municipal Court last month, Miller testified that she was "sleep-driving" while under the influence of medication. Her defense team argued that she should not be held legally responsible. Miller, 41, told the judge that she had taken a 5mg Ambien tablet and consumed a glass of altar wine, and had no recollection of the crash. She said she was unaware of the possible side effects of Ambien, which she took to help her sleep and treat chronic pain. She said she did not remember driving about 20 miles from St. Veronica's, her North Philadelphia convent, to South Jersey. When she woke up, Miller said, she was wearing her habit and veil, and was handcuffed at the police station. Police officers testified that Miller had alcohol on her breath, had slurred speech and bloodshot eyes, and was staggering when she got out of her car. She failed two field sobriety tests and refused to take a third, police said. The judge in the case rejected the "Ambien defense" and convicted Miller of driving while intoxicated. The judge immediately suspended her license for 90 days and fined her $257 plus fees. She must complete a 12-hour course for drunken-driving offenders. Miller, a nun for 17 years, wants to return to the classroom, Lindy said. A petition seeking to have her reinstated received thousands of signatures. "It would be a shame and a real loss to the students at Little Flower if she could no longer teach," Lindy said. "A finding of culpability in a low-level, noncriminal case certainly shouldn't bar anyone, particularly Sister Kim, from teaching high school." It was unclear Thursday when the archdiocese would decide whether she will be reinstated. "Any decision will take into account what is best for the students, the school community, and for Sister Kimberly," Gavin said.